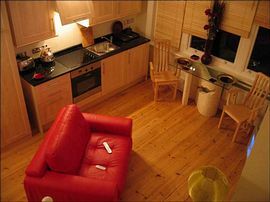 Situated bang in the centre of town, this unique designer studio apartment sleeps 2 guests. The apartment is on the doorstep of the busiest banking, bars, business and entertainment district, west of the West End of London. The most condensed square mile of restaurants, offices and clubs in Britain. 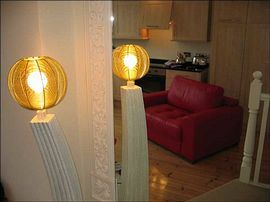 Ideally located for guests visiting the city on business, or for sightseeing or shopping. The studio is situated on the quiet side of the building, three floors up, facing the sunshine, and overlooking the historic St Nicholas Market. Here you can enjoy total privacy, 45 seconds above the city swirl! Location within 100 yds of everything. 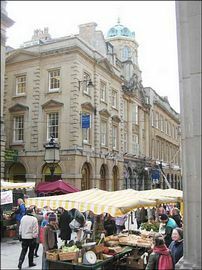 Local Services: Overlooking St Nicholas Market, restaurants, stalls, antiques, clothes, gifts, speciality shops. Corn Street is full of bars and restaurants. Baldwin Street is the most central main thoroughfare, from this turn into St. Stephens Street and right into Corn Street. Park at "the top" before a 90 degree turn to the left. BS1 1HQ. Trains and coach stations are less than half a mile west and north respectively. Airport approx 6 miles, buses running from Temple Meads (trains)every 20 mins. £75.00 for one night reducing to £50.00 for anything more than 5 nights.